Unfortunately by the time this happened, I'd been sleeping all day, so it's now 3 a.m. and I'm still here at the computer finishing up stuff. All of the trip photos are now on Flickr and linked in the left column here. Several are also posted to Facebook. What I want to do tomorrow is clean up all the entries I wrote on the road, adding extra details and including photos to make them read more interesting. I still haven't had the chance to cook any of the Trofiette that we bought in St. Margherita Ligure in a mad dash to the grocer's on our way out of town. 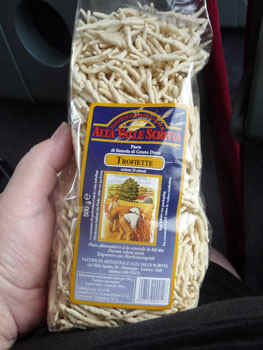 According to my on-line research, Trofiette is "a traditional, and one of the most popular, Ligurian pasta shapes." Jeri had it with pesto in Portofino (while I had the fabulous pesto lasagna) and everybody decided they wanted to bring some home. Again, the internet tells me that it's "made using durum wheat semolina and water. This thin, tight twist shaped pasta has the appearance of being hand rolled and then pinched at each end. It is commonly served with basil pesto or walnut pesto since its twisted shape holds these sauces nicely." The dogs are a little confused (and perhaps a bit annoyed) with me because I just am not where I'm supposed to be. At 3 a.m., I am supposed to be lying down on the couch in the living room with Sheila by my side and every time I get up from the computer to do anything, Sheila is right next to me, hoping I'll go into the living room so all can be right with her world. Lizzie doesn't understand this "always in the recliner" business and wants me to get up and interact with her RIGHT NOW, though she is very gentle as she steps on my stomach, experience having taught her that I do not react well to having her full weight on those pointy paws grinding into my fleshy abdomen! Oh...apparently we had a celebrity on our flight back from Paris. Sully Sullenberger and his family were on the plane, our tour organizer reports. . Someone else on the trip said she saw him going to use the facilities and decided not to stop and talk to him. Some final thoughts about the trip. I've been going back and looking at the web sites for all the hotels in which we stayed. Shortly before we left Jeri called to ask where all her money was going. The trip was about $6,000 each and now that we are home it's clear that a bunch of it went into upgraded hotels. The hotel in Paris that ripped me off on internet access is $226 per night; the hotel I loved and wanted to live in forever in Arles is $185 per night. The hotel in Nice that was OK, but nothing special was $155 a night. Two person rooms in the hotel in St. Margherita Ligure list at $320 a night (and you have to pay to use a chair on the private beach and pay 5 euro an hour to use the internet). Rates at Casafrassi, the lovely winery in Siena, were "from $203.91." I think that pretty much explains where our $6,000 went. When you're paying those prices to a company that arranges the tour, it seems a bit petty to have to collect 5 euros a person for use of the Paris metro or not provide wine at the "upgraded dinners." But this was a once in a lifetime adventure. I loved seeing the places I saw. I hated having no leisure time to explore and feeling overwhelmed all the time. It was great having a half hour lecture on what to look for in Notre Dame, but it would have been nice to have been given more than 15 minutes inside the church itself to see things up close and personal. It was lovely seeing the buildings at Pisa, but we were shuttled in and out without ever having the opportunity to look inside any of the buildings, including the church where some lovely music was playing. I've never been on an organized tour before and maybe that's the way things are. The "if it's Tuesday it must be Belgium" mentality. But I'd rather go to one place, stay in a cheaper hotel, and take my time exploring the area. I don't know that I ever want to go back to Paris again, but I wouldn't mind spending a week in the Avignon/Arles area and savoring all the places where Van Gogh painted ... in the springtime, when it's cooler!!! But it's all a learning experience, right? 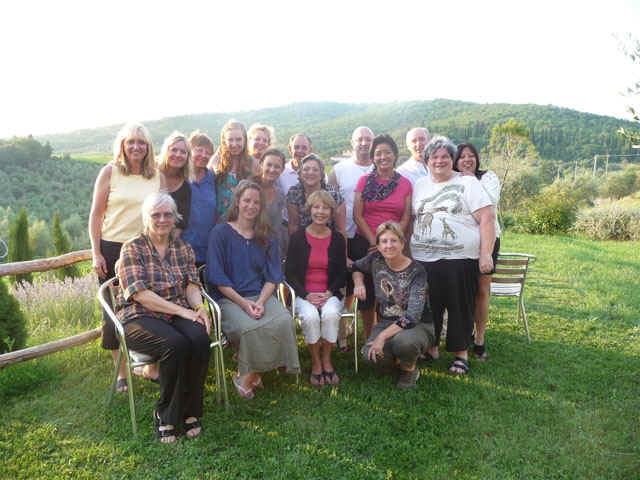 I have great memories, made nice friends, and learned a lot about the history of France and Italy, some of which I even remember. But I probably wouldn't do it again, at least not this kind of tour.